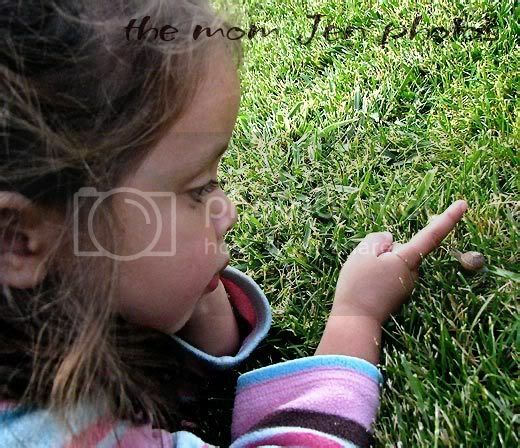 K has had a fascination with snails lately. Everyday she spends time outside searching for snail trails to find her little friends. "Me wants to play with them." "Me want them to sleep in my bed." "Me wants to hold them like a baby." Sometimes she's the teacher educating her class. Often the slime in her hand get a little too much for her. But, she still tells everyone she sees to be nice to them and don't "step on my friends." She placed a few on her bike and scooter once, and took them for a stroll. She found a jar and put leaves in it and wanted to keep them inside. Unfortunately the jar originally housed peanuts. Alas, the poor girl understands that some snails don't live forever. But, she still loves them. Hey wait, what's going on here?! "They's just getting a piggy-back ride!" If her dream comes true, I think the Easter Bunny might put one in her basket. But not next to the salted peanuts! OMG! That is hilarious! My favorite is third picture. She does look like a very patient teacher there. OMGosh...those were some great pictures. I can't believe she likes snails. She is a good teacher too:) My son used to give worms rides on his tricycle. Wow, what a great series, just amazing with the narrative and the precious girl. Awesome job Jen! Yikes! My girls wouldn't touch one with a ten foot pole! I don't think I've ever seen so many snails in one spot before. Did she get one in her Easter basket? My kids got a snail for Easter! It came with the frogs! Cute pictures...well except that last one! LOL! Eek. How sweet! Well written and beautiful photos. What a kind heart she has. The salted peanut jar! I am crying with laughter! That is a lot of snails! I find one or two a year, tops. What a generous heart your daughter has. Excellent pics! 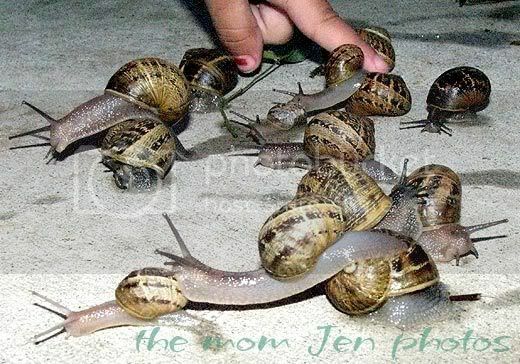 But all those snails in one place kind of creeps me out--but at least they are not slugs. I would need a doctor after seeing that. That is too funny. It's good that she has something she's excited about. I can't believe you have that many snails around...it gives me the heebee geebees! That is way TOO cute! I had a similar baby frog obsession when I was her age! Who wouldn't want one of those beauties for Easter?? Only a crazy person, that's who. I am on my way to add "Snail" to my Easter wish list. I was going to ask where in the world you were getting all the snails but those last few pics let me know. You have some very "active" critters there Mom Lady! Love your illustrations! What a sweet girl! 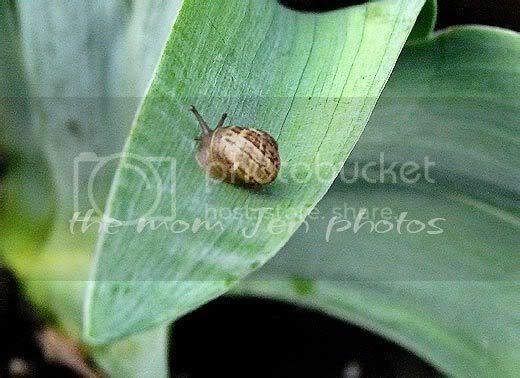 very cute photos, a little too slimy for me! I have at least one scrapbook page of Matthew and snails about 6 years ago! He even had his camera out and was taking pictures of them! 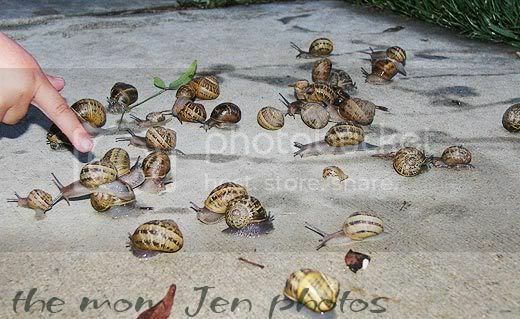 I don't think I've ever seen a snail in my entire life and you've got tons of them! Creeping me out! But the pics are awesome! What the heck? How in the world do you have that many snails lurking around? That first photo is really beautifuly. The others, just beautiful, and some cute. 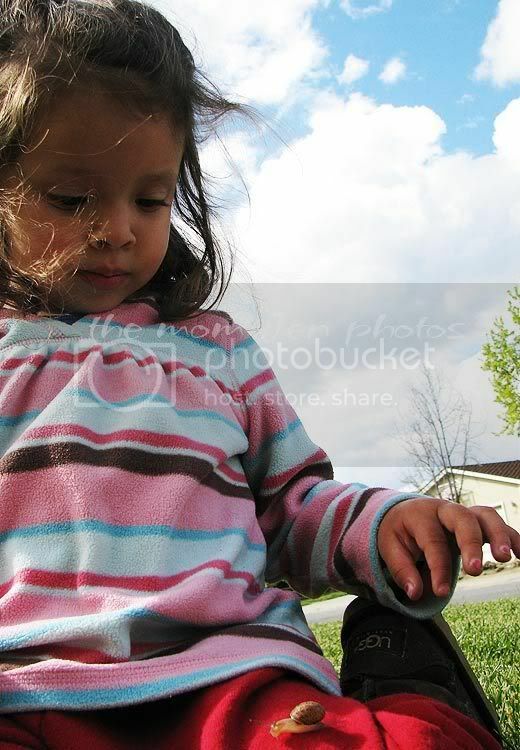 I do not remember knowing a young child with a thing for snails before. I'm going to have to think on that. Wow - those are some amazing pics - and the last one is pretty gross! LOL. I think you have a future scientist in the family! Oh my gosh!! my daughter would me in heaven! Holy crap. 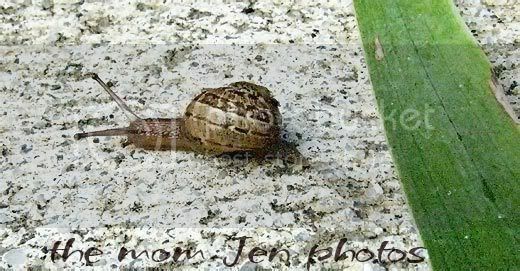 I have NEVER seen a snail in person in my life! I can't believe all of the snails! Isn't it adorable how they get so excited about somethings. Personally I think snails are yucky. Good thing you can handle the snails and slime. Wow she has a lot of little friends! Really ? She took them for a scooter ride! AMAZING pictures!! What a great scrapbooking layout you could do with those! If you scrapbook of course! Oh my gosh. That is a LOT of snails!!! I see ONE once in a while, but never that many all at one time! Wow! Where do all these snails come from? I live in New York City and we don't have a lot of snails in these parts. I love that she thinks of them as friends. How sweet is that! Yep! That was me 5:30 at the ball park! It was my little guys first t-ball practice! This is Fun!I'm on the look out know ! :)Oh BTW, I read some of your previous post. Your nephew B was on my little guys soccer team!Sweet Kid! Great parents! Haha, piggy back rides! When I was little, I once saw two horses giving piggy back rides....I'm still scarred. Those snails are kinda creeping me out, but she's adorable! oh my! takes me back to my snail days! 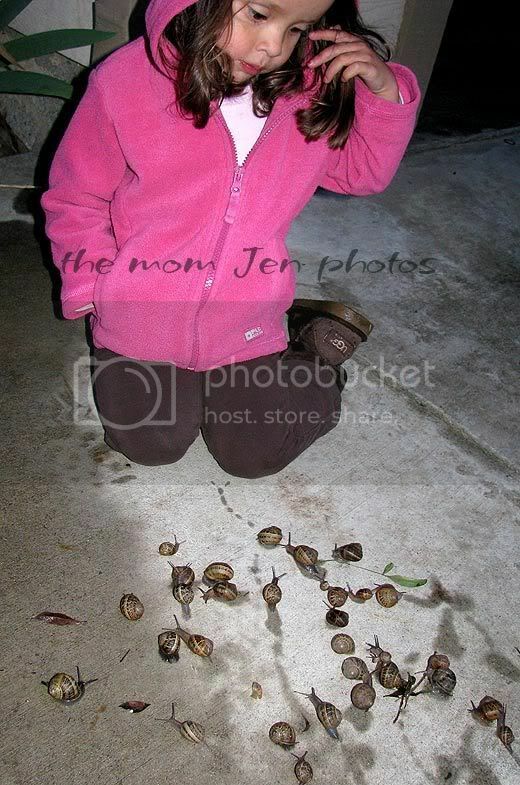 I loved snails when I was little!!!! how sweet and gross at the same time! Bwahaha! Piggy back rides! I love a girl who doesn't mind getting her hands dirty!! very cute though that she seems to love all things in the world :) i did laugh a little about the salted peanuts jar tho.